Twitter has been very kind to me. I've "met" loads of interesting people and made several wine-related contacts. One of those is John Kouphou, Executive Chef at Elea Estate in Paphos since 2010, fellow wine aficionado, passionate Arsenal F.C. fan and Twitterati. He's worked in Dubai at The Atlantis and The Palm and has cooked up storms for a slew of celebrities including Bobby De Niro, Michael Jordan and Charlize Theron (lucky dog!). I haven't yet paid him a visit to sample his innovative Club House cuisine but it's on my never-ending bucket list. In any case, he was kind enough to set aside his sparkling spatulas and take a crack at the blog's short-but-sweet case of questions. Let's see how he fares. CJK: Wine fits with any mood, social gathering (i.e., friends, family), time of day or [even] time of year. CJK: I was around seven years old during the 70s and my parents used to drink Mateus rose. I remember the shape of the bottle. All-time favourite bottle of wine? CJK: Sauvignon Blanc from Marlborough, New Zealand. [Its] oaky, acidic, crisp smokiness. CJK: The big wineries [Editor's note: I assume Chef John refers to KEO, LOEL, ETKO & Sodap] need to take a leaf out of the small bespoke wineries. CJK: If the big wineries invest time and money in small wineries, we will be on the right road. CJK: The endless possibilities of food and wine pairing. CJK: To continue to be innovative. Who is your favourite wine personality? Why? CJK: Kate Goodman [Host of a revamped Food and Drink on BBC Two.] She is a straightforward wine talker. CJK: I love the Zambartas Cabernet Franc/Lefkada Rose. You can taste the raspberries and pomegranate. Beautiful. You can find Chef John on Facebook (https://www.facebook.com/chefjohnkouphou) and on Twitter (@chefjohn_). 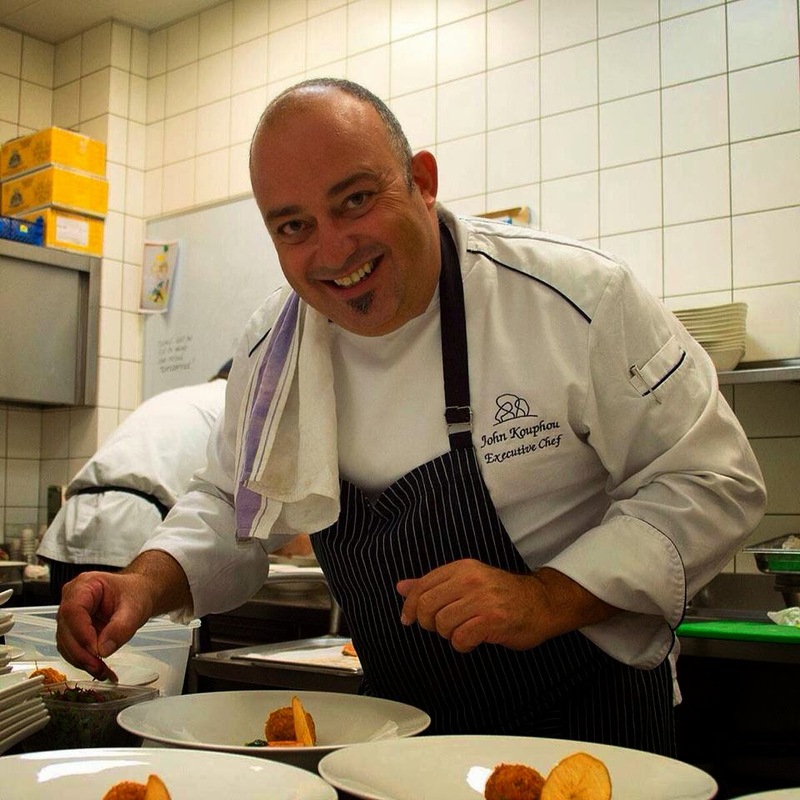 He works his culinary magic in Paphos at Elea Estate.